Welcome to another edition of Constellation Friday! Today, in honor of the late and great Tammy Plotner, we take a look at the winding river – the Eridanus constellation. Enjoy! One of these is the southern constellation of Eridanus, the sixth largest modern constellation in the night sky. The constellation takes its name from the Greek name for the river Po in Italy and is represented by a celestial river. This constellation is bordered by the constellations of Caelum, Cetus, Fornax, Horologium, Hydrus, Lepus, Phoenix, Taurus, and Tucana. In ancient Greek mythology, Eridanus represents the Po River in modern-day Italy and its winding, twisting path is associated prominently with two Greek myths. Eridanus was once believed to be the waters which flowed from Aquarius the water bearer. In other tales, Eridanus is associated with the unfortunate Phaeton, who wrecked Apollo’s sky chariot and died. Eridanus may have been the path the chariot took, twisting and turning wildly as the boy sought to control the wild horses to no avail. Perhaps he came to close to the Earth, burning people’s skin and parching the land to become a desert. Perhaps Zeus intervened by sending a thunderbolt to stop him. Perhaps Eridanus is the river of the underworld into which Phaeton fell when he died… Perhaps we’ll never know! While there is no consensus on the origins of this constellation, one theory is that it takes its name from the Star of Eridu, which is named for the ancient Babylonian city in southern modern-day Iraq. Located in the marshy regions near the Euphrates river, this star was sacred to the god Enki-Ea who ruled the mythical fresh-water reservoir that flowed beneath the Earth’s surface (the Abyss). In Indian astronomy, the asterism is also depicted as a river and is known as srotaswini, which means “stream,” “current,” or “torrent” in Sanskrit. In accordance with this tradition, the constellation is depicted as the Ganges river flowing from the head of Dakshinamoorthy or Nataraja (a Hindu incarnation of Shiva), who is represented by the constellation Orion. In Chinese astronomy, the northern part of the constellation is located in the White Tiger of the West (Xi Fang Bai Hu). The southern stars cannot be fully seen in China, and were not incorporated until the late 16th/early 17th century by astronomer Xu Guangqi, which introduced these and other southern asterisms based European star charts. This constellation has also been identified with multiple rivers around the world, which include the Nile River in Egypt and the Po River in Italy. 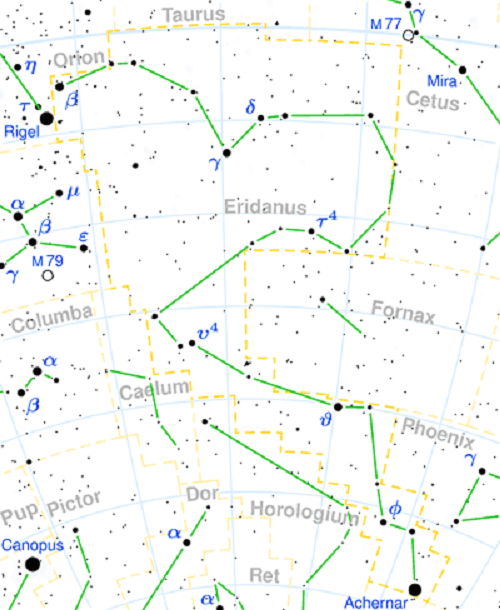 Eridanus is one of the original 48 constellations included by Ptolemy in his 2nd century CE tract, the Almagest, and is one of the 88 modern constellations recognized by the IAU. This huge, rambling constellation spans 1138 square degrees of sky, has 4 bright stars, 24 main stars which comprise the asterism and 87 stars with Bayer/Flamsteed designations. The brightest among them is Achenar, a bright, blue B-type star located about 144 light-years from Earth. The name is derived from the Arabic Akhir an-nahr, which means “the end of the river.” Of the top ten brightest stars in the night sky, Achernar is ranked ninth and is also the hottest and bluest. Achernar is also the least spherical star to be observed in our galaxy, which is a consequence of its very rapid rotation. The third brightest star is Theta Eridani (Acamar), a binary star that may be part of a multiple star system located 161 light years away. The star’s traditional name comes from the Arabic Akhir an-nahr, which means “the end of the river”, which corresponds to the fact that Acamar was once the brightest star in the constellation and was seen as the end of the celestial river, Eridanus. The Eridanus constellation is also home to Epsilon Eridani (aka. Ran, after the Norse goddess of the sea), the third closest star system to our Sun (10.5 light years away) that can be seen with binoculars. It is also home to the exoplanet Epsilon Eridani b (aka. Ægir, the Norse god of the ocean and Ran’s husband), a Jupiter-sized planet that was detected in 2000 (but remains unconfirmed). Eridanus is also home to several Deep Sky Objects like the Witch Head Nebula, a faint reflection nebula located approximately 1000 light years from Earth. It is thought to be a remnant of an ancient supernova or a gas cloud that is illuminated by Rigel in the neighboring constellation of Orion. There’s also the Eridanus Group (aka. the Eridanus Cloud), a group of about 200 galaxies located roughly 75 million light years from Earth. And then there’s the The Eridanus Supervoid, an area of space that contains no galaxies and was discovered by analyzing “cold spots” in the Cosmic Microwave Background (CMB). 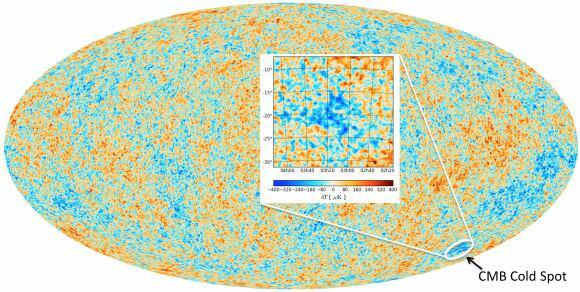 At about one billion light years in diameter, this is the largest supervoid ever discovered. The cause of supervoids cannot be explained, but it has been speculated that this void may be the result of quantum entanglement between our Universe and another. In total, Eridanus contains seven stars with known planets and has no Messier Objects associated with it. There are also no meteor showers associated with the constellation. Eridanus is visible to observers at latitudes between +32° and -90° and is best seen at culmination during the month of December. With such a huge constellation to explore, it’s a cinch to know that we’ll not be able to reveal everything that can be seen with a telescope or binoculars, but let’s try highlight a few favorites. First let’s start with binoculars way down south and Alpha (the “a” symbol on our map) Eridani – Achernar. Although classified as a main-sequence dwarf star, Alpha shines 3,000 times more luminous than our Sun and it’s the least spherical star in the Milky Way studied to date. That’s right… It’s a rapid rotator. In fact, Achernar spins so rapidly that its equatorial diameter is more than 50% greater than its polar diameter! Now, let’s go to the northern extreme and have a look at Beta Eridani – the “B” symbol on our map. While there is nothing particular unusual about Cursa itself, it’s what Cursa is part of that makes it special. In this instance, we’re looking at a star that belongs to a supercluster. These are large, young, massive stars that if we at a greater distance would appear as a open cluster – they move in tandem with each other. There are three major superclusters within 500 light years of the solar system: The Hyades, The Pleiades, and very close to us, The Sirius Supercluster. These superclusters contain hundreds of very young stars, some as young as 70 million years – including stars such as Sirius itself, Beta Aurigae, Alpha Coronae Borealis, Zeta Crateris, and Beta Serpentis. Continue with binoculars to Omicron 1 Eridani – the “O1” figure on our map. This pair will greatly resemble a faded version of the Gemini twins – Castor and Pollux – in the field of view. While the Omicron pairing appears connected, don’t be fooled. Omicron 1 is about 125 light years away from our solar system, Omicron 2 is only a little more than 16 light years away! Now, put your telescope on Omicron 2, because it is a nice triple star system which has a 9th magnitude white dwarf star companion and an 11th magnitude red dwarf star companion, too! If you’d like to tour some variable stars in Eridanus with your binoculars, have a look at Gamma, Delta, Lambda and Nu Eridani. All of these are variable stars, including a few Cepheids, but their changes are very slight, only about half a magnitude. However, it’s still quite fun to watch and I encourage keeping track of changes! Now let’s get out the telescope and have a look around. Our first stop is NGC 1232 (RA 03h 09m 45.5s Dec -20 34′ 46″). If this 11th magnitude grand design spiral galaxy doesn’t smack your eye, nothing will. Located about 70 million light-years away, NGC 1232 is dominated by millions of bright stars and dark dust, in spiral arms rotating about the center. Open clusters containing bright blue stars are sprinkled along these spiral arms, with dark lanes of dense interstellar dust between. Less visible are dim normal stars and interstellar gas, producing such high mass that they dominate the dynamics of the inner galaxy. Not visible is matter of unknown form called dark matter, needed to explain the motions of the visible material in the outer galaxy. NGC 1232 and its satellite galaxy (NGC 1232A) are part of the Eridanus cluster of galaxies, along with NGC 1300. Now, let’s look at NGC 1300 (RA 03h 19m 41.1s Dec -19 24′ 41″). This incredible barred spiral galaxy is one of my personal favorites. In 2005 the Hubble Space Telescope took a look at NGC 1300. Its resolution, a myriad of fine details, some of which have never before been seen, is seen throughout the galaxy’s arms, disk, bulge, and nucleus. Blue and red supergiant stars, star clusters, and star-forming regions are well resolved across the spiral arms, and dust lanes trace out fine structures in the disk and bar. In the core of the larger spiral structure of NGC 1300, the nucleus shows its own extraordinary and distinct “grand-design” spiral structure that is about 3,300 light-years long. Only galaxies with large-scale bars appear to have these grand-design inner disks — a spiral within a spiral. Models suggest that the gas in a bar can be funneled inwards, and then spiral into the center through the grand-design disk, where it can potentially fuel a central black hole. NGC 1300 is not known to have an active nucleus, however, indicating either that there is no black hole, or that it is not accreting matter. I can’t help but wonder what John Herschel would have thought if he’d known all this when he discovered it in 1835! Now try NGC 1332 (RA 3:26.3 Dec -21:20). At magnitude 10, this big, inclined spiral beauty is part of the Eridanus Super Group. What doesn’t show to the telescope is a thin, unresolved dust lane which crosses the diffuse light distribution about 0.3″ northeast of the central peak from south-east to north-west, along the orientation of the galaxy’s major axis. A little neutral hydrogen for the soul…. Before we leave galaxy country, turn your telescope towards NGC 1385 (RA 03h 37m 28.7s Dec -24 30′ 07.2″). In all respects, this is one very disturbed galaxy. This great barred spiral gives an awesome view in even the smallest of scopes. As you slide north, you will encounter a host of galaxies, NGCs 1386, 1389, 1404, 1387, 1399, 1379, 1374, 1381 and 1380. There are galaxies everywhere! But, if you lose track? Remember the brightest of these are two elliptical galaxies – 1399 and 1404. Have fun! Ready for a nice telescope challenge? Then try planetary nebula, NGC 1535 (RA 4:14.2 Dec -12:44). Often referred to as “Cleopatra’s Eye” this 10th magnitude planetary nebula is sufficiently bright and large enough to be handled by small optics and shows a pleasing amount of detail. Don’t be surprised with a larger telescope to catch some inner structure and a pale aqua color! It takes very, very well to magnification so don’t be afraid to use those high power eyepieces. For astrophotographers, try your hand at IC 2118, better known as the “Witch Head Nebula”. It’s a very large, faint reflection nebula illuminated by neighboring Rigel and the results can be quite impressive! Don’t forget, there are many more wonderful objects to be explored in Erindanus, so get yourself a good star chart to navigate by and go sailing on the “River”!